The INITIATION Lineage of Light from which we are seeded may be traced back to our Star Ancestors or ‘Akhus’ as the Egyptians knew them. It was during the Zep Tepi (‘First Times’) long before the birth of modern civilization, that the Legacy of Our Sacred Mission as Initiation Lightkeepers began. In the cradle of Egypt, the Akhus from Sirius first initiated the Ascension Program on Earth for the Initiation, quickening and purification of the human genetic code. The Egyptian ‘Gods’ known as Isis and Osiris (depicted on the left and right obelisks) were Akhus who began a heritage of Priestesses and Priests whose holy energy of Initiation descends all the way through present times, and among other historical figures includes Mary Magdalene and Jeshua (Christ). The Sphinx and Pyramids of Giza, which anthropologists now date back to at least 13,000 years ago (and up to 52,000 years), were initially created by the Akhus as a Stargate in precise time-space alignment with Sirius, Orion, the Pleiades and the constellation of Leo (whose stellar Leonine connection is further signified by the Lion-body of the Sphinx). The pyramids of Giza have long been proven to be in the exact same configuration as the three stars of Orion’s belt (which the ancient Egyptians identified with Osiris). During equinox and other significant astrological cyclic points, the light of these stars shines through specific shafts and openings in the Great Pyramid and activates the energy of this stargate vortex site. The Pyramid’s precise architecture holds all the geometries and dimensions of the Earth (circumference, weight, etc). The purpose to which these powers were harnessed was to facilitate the initiate’s quest for immortality or mastery over the domain of consciousness. The Great Pyramid was used as an Ascension Chamber for many initiates (including Jeshua the Christ) and is also a transducer for Cosmic energies into the Planetary Field. Not only is this stargate calibrated to these spatial coordinates, but it is also attuned to the Precession of the Equinox of the zodiacal signs and the 26,000 year cycle of Earth’s revolution around the Pleiades star system. Beneath the Sphinx are many multi-dimensional chambers of Initiation and the Akashic Records Library, which holds the memories and codes of all Earth existence and our entire Universe. Priest and Priestess Initiate and walk into the Stargate together. Isis and her sister Nepthys in their winged form create the gate and act as Protectors allowing only the Pure to enter the Sacred Dimensions. As the Divine Couple have fulfilled their Earthly Mission, they undress from their Priestly Robes and enter naked once more back into the Duat (translated as ‘Kingdom of Osiris’ or “Dwelling Place of Orion and Sirius’) (the Heavenly Realms). 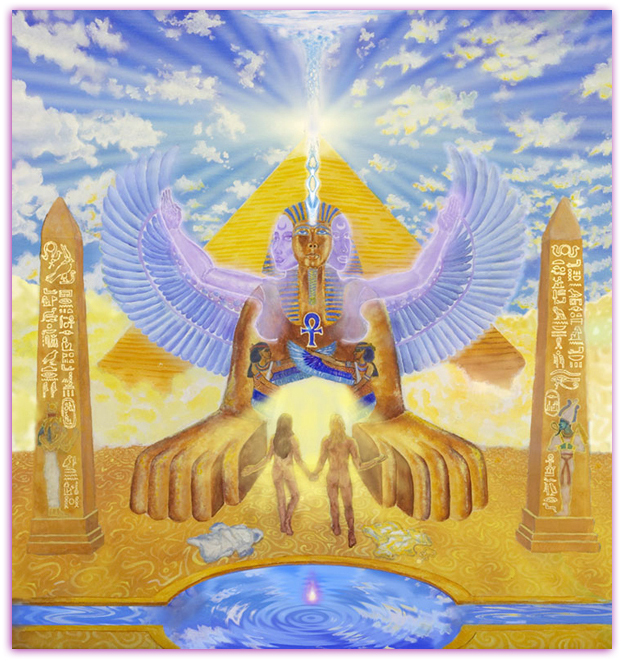 The three aspects of the Divine Masculine and Feminine are represented in this painting: the human-embodied aspect, the Christed Initiated aspect (represented by Isis and Osiris on the obelisks) and the God/Goddess aspect represented by the Sphinx and the Winged Goddess. The Sphinx (whose face was a representation of the God “Atum”) is the Solar Principle and Unity Consciousness. The two faces of the Goddess on either side of the Sphinx face represent the Lunar principle, as well as the Dual or Creative Consciousness. Ultimately, the humans consecrate their Sacred Marriage and realize they are divine embodiments of the God/Goddess.